Evans Incorporated’s 25 Year Anniversary is approaching, so we’re taking the next few months to reflect on where we are currently and what’s to come! This includes highlighting one of our areas of specialization per month through September. The focus for the month of September is High Performing Teams (HPT). Our tagline, Human-Centered Change That Works®, is based on the idea that our focus is not solely on the transactional aspects of change and program management. Rather, we acknowledge that people are what drive your organization forward. Each individual team is a very important aspect of the organization. There are many indicators to a successful team, but one in particular signifies if the team will be lasting and long-term: resilience. But how do you ensure your team is resilient? 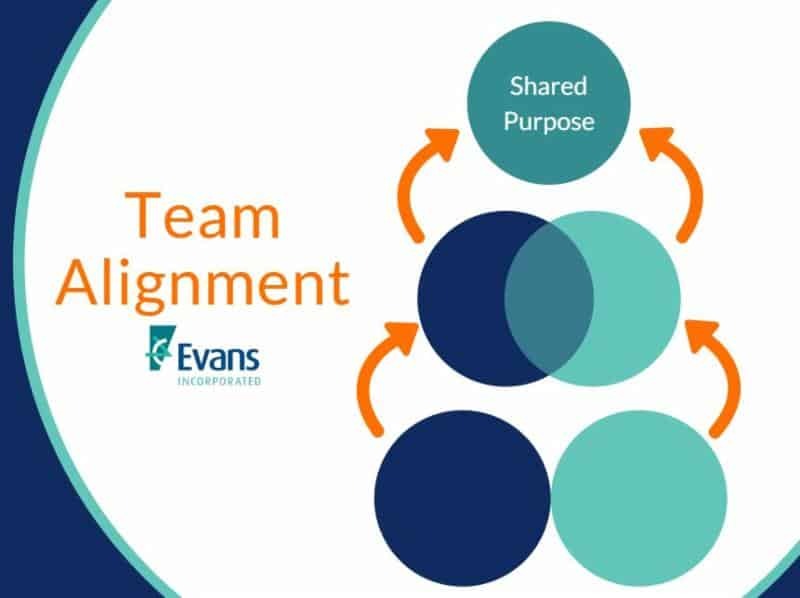 The first team aspect Evans considers when helping our clients build a resilient, high performing team is the team’s alignment, and that’s what we will focus on in this Thrive in Five! Do you want to get inspiring and growth-oriented messages to fuel your learning and be your best self? Click below to get the bi-weekly Thrive in Five messages sent directly to your inbox! As with a whole organization, for a team to be successful, it must be resilient and dynamic – capable of maintaining a high level of performance in the face of changing conditions and evolving in response to emerging trends. To enable that endurance and flexibility, the team must first define and embrace its common goal and shared purpose. Establishing that foundation as you assemble your team will set you up for long-term success and will provide key context to new members of your team that join over time. What does it take to establish that foundation? The first step is to building a high performing team is to create alignment. Team alignment exists when there is a strong team road map for success and members choose to follow it. Having a unified purpose gives team members a common understanding that drives the upcoming work, so even those who don’t see directly eye-to-eye are able to work together to fulfill the team’s ultimate purpose. Similarly, creating this sense of a shared purpose will remind your team of its relevance and drive you through periods of slow momentum or change. Take Hamilton (the musical) for example (Don’t worry! No major spoilers!). There were multiple parties who shared a common purpose of winning the war against the British (to gain independence), although many of them did not share the same strategy to do so. Even Hamilton and the great George Washington disagreed on the tactics, ending in George Washington sending Hamilton home. Despite disagreements, Washington and Hamilton shared an underlying understanding of the ultimate purpose of the war and continued to work together to ultimately win the war and fulfill their mutual purpose. Apply in your next team meeting with a 30-minute discussion! One fun and engaging way to create your team’s alignment is to have all the team members find a picture in advance of your next team meeting. It could be a picture from online, from a magazine, or it could even be a personal picture. Each team member should pick a picture that describes what he or she thinks portrays their interpretation of the team’s purpose or what success looks like. Once you have your team together, ask each team member to share his or her picture and describe how the image resonates with them with respect to the team’s purpose and what success looks like. Remember, there are no right or wrong answers at this point. The intent is to get the team talking together. Once everyone has shared their various interpretations, use that opportunity to generate discussion about creating a shared purpose. It’s a really easy way to connect and at least talk about each individual’s understanding of the team’s purpose, and it could also potentially lead to a discussion about how each team member believes he or she can contribute to the purpose. Would you like some more guidance on how to create team alignment? Or perhaps you’d like help structuring a team alignment meeting? Our High Performing Teams experts are happy to help! Click below to reach out to our HPT team. What better way to inspire you to thrive than to hear about real people making it happen? And what better way to learn about Evans than to make those real people Evans employees and partners? 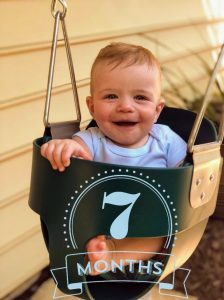 Actually, meet my 7-month-old son, Lucas, who’s way better looking! First, we’ve been pushing senior leadership to think more strategically about how to organize program resources (i.e., people) for work more collaboratively across agency lines and think beyond the next step in the acquisition process. We’ve done this by encouraging them to revisit the documents that established the program and tried to define the ways the agencies would partner together. What did Congress, the Office of Management and Budget (OMB), and the partner agencies have in mind when this program was established? How should that initial vision be revised to reflect needs of the program that have emerged since its inception? Revisiting – and revising – this foundation helps provides a sense of purpose that is crucial for alignment. We’ve also been redesigning the program’s organizational structure, comprised of a multitude of teams, each with defined functions and shared purposes. We’ve interviewed staff from across the program to understand their work and capture their ideas for how people could work better together. This is culminating in a new governance model that is anchored by the common mission of the program and details the functions of teams throughout the organization, and responsibilities of key individual roles within those teams. We’re hoping that when everyone shares a similar mental model of the program, people will find themselves within it more easily. Our experience illustrates the value of taking the time to step back, then think about why and how your team started, and where it’s going. With that context, your team should have a clearer, shared idea of team purpose, bringing all members into alignment. Finally, your team should start to gain an understanding of how each individual can contribute in pursuit of the common goal.